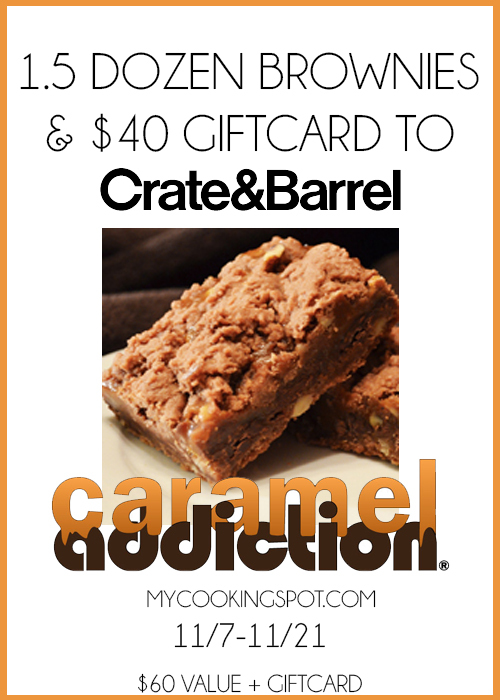 Caramel Brownies with Crate & Barrel Gift Card Giveaway! Are you excited for our giveaway this month? Because you should be. Two words: Chocolate and Caramel! That’s right! We giving away $60 worth of ooey, gooey, delicious caramel brownies from the amazing shop in Scottsdale, AZ; Caramel Addiction. These brownies will change your life and the best part is that they will be shipped to your house just in time for the holiday’s. You can keep them for yourself, or give (some) away for gifts. You will be loved for life once they have tasted these brownie. Not just that, who would’t love a gift card for all your cooking needs this holiday season to Crate and Barrel? Exactly! Chocolate and shopping? Hello Heaven! Thanks to Sherrye for offering up her delicious brownies from her online shop: Caramel Addiction. 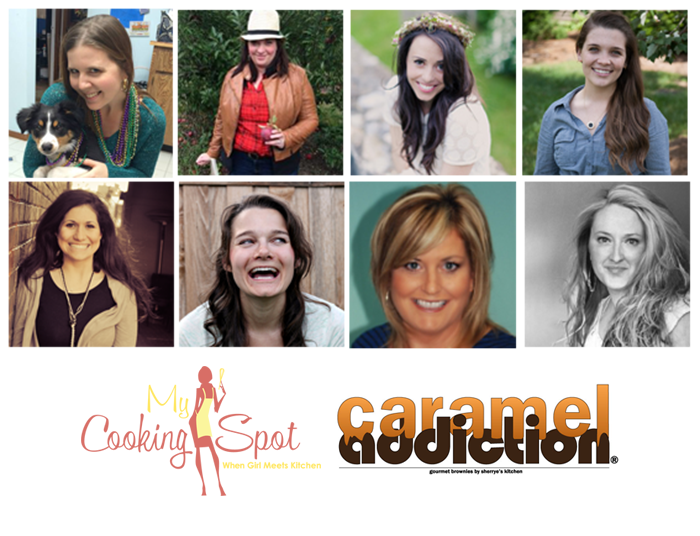 And thanks to the Cooking Spot contributors. Be sure to check out all of their blogs, and enter the giveaway below. Thanks For The Yummy Giveaway & I Can Always Use Some Extra Cash!! Omg how yummy is this giveaway!!!! Thanks for sharing!!! Thats a nice sweet giveaway! I would like some nice hot brownies right about now. This is a great giveaway. I love chocolate and caramel so this is right up my alley. Awesome giveaway. Who wouldn’t love to win brownies and shop at Crate and Barrel?! Oh, man! SOOO yummy! I need to make these! These are the types of things that make me wish we had a crate and barrel around here. I’m so sad we don’t. These look amazing. I want to win! You can’t put caramel in front of me and not expect me to react. These look INCREDIBLE! This is such a great giveaway. Chocolate and caramel are two of my favorite things. I could so go for one of those brownies right now, I need to make a batch as soon as possible to cure my sweet tooth! Looks so yummy! Hope I win those brownies! Those brownies look so delicious! I’d love to have those! These look absolutely delicious. Yes! This has to be one of the yummiest giveaways that I have seen. Goodluck to all caramel lovers out there who’ll join. Those two words really make me sooo excited! 🙂 I love those together or apart. I bet many would join the giveaway! I’m definitely entered for this one. Thanks for sharing/hosting. Great giveaway! Those brownies look amazing! What a great combination! I am more about chocolate than caramel but together yumm!!!!! Hope I Win! Great giveaway combination too! I have never had caramel brownies, but they sound scrumptious! This is an awesome giveaway and the brownies look so delicious indeed. This would make a great gift for Christmas for my dad. Thanks for sharing. Those brownies look so delicious! Thanks for the awesome giveaway! Oh, how yummylicious! Now I need a brownie!